As the primary trade war between the U.S. and China suddenly shifts over into a proxy war between the Trump Administration and Russia over Syria, an interesting policy change may be coming out of Moscow that previously wasn't invoked during the past five years of sanctions directed against them. And that is the complete banning of U.S. goods into Russia. When the U.S. funded the Maidan coup back in 2013 to overthrow the Russian friendly government in Ukraine and bring the border nation closer to NATO, they instituted a number of economic sanctions against Moscow after Putin aided Eastern Ukraine from being taken over by the new puppet government. However Moscow's response wasn't necessarily to go after the U.S. through the use of their own retaliatory sanctions, but instead strike at their allies in Europe which has proven fruitful in harming EU economies. Now the game plan could be changing as on April 11, Russia's Prime Minister let it be known that the banning of all U.S. products into their economy could be the next step in retaliation to more U.S. imposed sanctions. Moscow may ban US goods as part of a response to the latest sanctions imposed by Washington, Prime Minister Dmitry Medvedev has suggested. 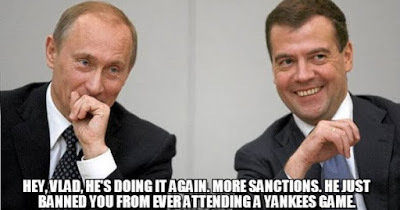 “These can be not only the American securities… but also a whole range of other goods that are delivered to the Russian market or produced by American businesses on the territory of our country,”Medvedev said, answering questions from the Russian State Duma on Wednesday. The prime minister stated that Moscow's possible response to new Washington sanctions should be adequate and measured. "Response measures should be well-calculated, should not harm ourselves, they must be adequate," he said.